Dust in the Air Suspended was an exhibition co-curated by recently graduated MA ACW student Sally O’Leary, (now of Asprey Arts) while previously working as Arts Officer for South Tipperary County Council, The exhibition was curated in conjuction with the Irish Museum of Modern Art and the Arts Council of Ireland. 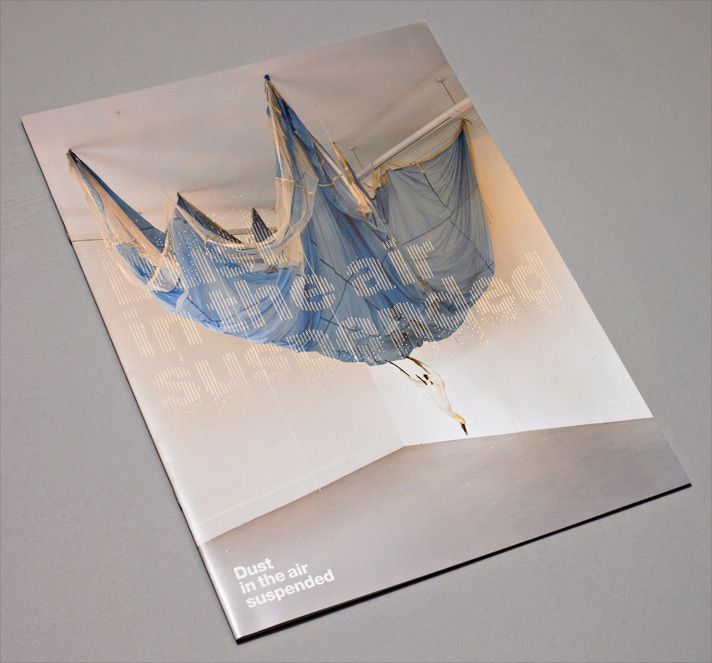 Diarmuid Slattery from the design company, New Graphic, Dublin, designed the catalogue, invitations, and posters for Dust in the Air Suspended. The exhibition brought together an exploration of the physical and metaphysical notion of ‘suspension‘ and the tensions that arise from the state of being ‘in suspense’. Artists included; Dorothy Cross, Gary Coyle, Antony Gormley, Ilya Kabrakov, Alice Maher, Fergus Martin, Austin McQuinn, Isabel Nolan and Jesús Rafael Soto. The 100 Archive is a website documenting visual communications in Ireland. The site is divided into two parts: 100 Future, which acts as a continuous record of contemporary professional work in the country, and 100 Past; an archive of100 selected projects submitted each year. The 100 Archive was initiated by four Dublin studios; Atelier, Conor & David, Detail and Studio AAD. The archive was officially launched in 2013, and has since received hundreds of submissions: a curatorial panel recently selected projects from 2010-13 for a place on the100 Past archive. For more information see http://www.100archive.com/learn.